John Doe is the operator of John Doe Guide Service. He has been vigorously fly fishing the Ozarks for over 7 years and has logged over 1600 days on the water since the fall of 1999. A typical day with John begins when the client is ready and doesn't end until the fish tell us it's time. John is one of the most patient teachers around and he prides himself on providing action while the client is still in the learning process. Most clients are ecstatic when they talk about how much he taught them in one day. John is the perfect guide to teach your spouse or children this wonderful art. Besides being a guide, John is a graduate of the University of Missouri in Columbia (May '97) with degrees in English and Geography. Writing is John's other passion, and he is scheduled to be published in several national fly fishing magazines. Also, John is an active conservationist and he has spearheaded several letter-writing campaigns to the Arkansas Game and Fish Commission. He was the vice-president of the reactivated/deactivated White River chapter of Trout Unlimited, and he is devoted to helping the trout waters in northern Arkansas reach their potential." John operates 2001 Marine Tech 21-foot fiberglass riverboat. It is equipped with plenty of dry storage, carpeted floor, and this boat is 6 to 12 inches wider than most of the other ones on the river. 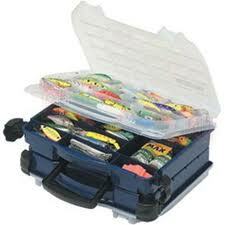 This allows ample room for fly fishing from the boat while providing an added element of safety. John's boat is one of the most spacious and comfortable boats on the rivers. ***All guide trips will be with John (unless he is booked for that day, and then he'll try and find the best substitute available). John works with the best guides in the area who are all familiar with effective trout techniques and tailwater safety. Please let me know if planning a group outing...I'll save you a lot of frustration. Also ask about group discounts when booking three or more guides. Old man was too hungry to cook the fish... We didn't know he was a sushi guy! Chris with some nice rainbows!!!! Chris and his fish ( . ) ( . ) s! Randy with his catch of the day. If you'd like, we can clean the fish for you. Nothing like rainbows and Old Style! Not a bad day on the river. Jason and his buddies ate good that night! Nice rainbow caught on the White River! Although fly fishing has been in existence in one form or another for centuries, the Ozarks has been slow to come around. But all that has changed recently. Now, fly fishing is just as big a draw as the old ways of angling (bait/spin fishing), and the fisheries are benefiting from increased catch and release practices. Because these rivers are periodically stocked, there are usually plenty of action fish around, and there are also significant numbers of wild fish. 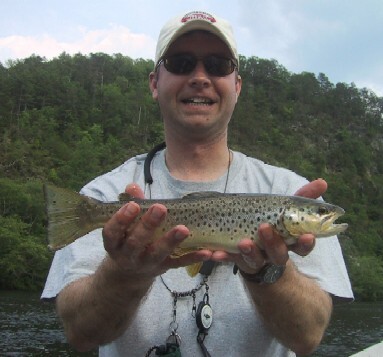 Arkansas Trophy Trout can tailor a trip to your specific desires. If you want to just target big fish, I know where to go. If plenty of action is what you desire, I'll put you on that, as well. As often is the case on the White and Norfork, it is possible to be engaged in plenty of action and still have a shot at a lunker, but there are specialized techniques and flies that can be utilized to target specific sizes and species of fish. Many of the factors that encourage the fish to feed have little to do with nature, but still, weather and the daily hatches can make all the difference in the world. A float trip during specific water conditions can be an enjoyable way to cover less pressured water and take in some marvelous scenery. Arkansas Trophy Trout has several float options, and it is usually possible to prearrange shuttle service. Please inquire about floats and there is no extra charge for float trips.Trips includes everything: lunch, boat, flies, leaders, tippet, sunscreen, etc. If you need to borrow a rod or reel, I can furnish one. Just bring your waders and a camera. All trips are Catch & Release ONLY. Caught a lot of fish on spinners..
Well this is a report about a report. I'm leaving in 5 days for Northern Wisconsin for some ice fishing. Will let ya'll know how it goes.